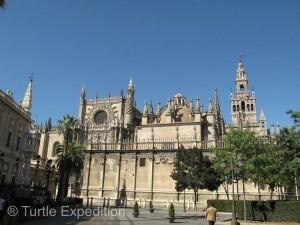 Heading east, we could not miss the magical city of Seville (Sevilla in Spanish). 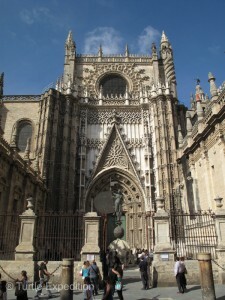 It had a feeling of a walk-around town, though one could easily get lost in the meandering pedestrian alleys and narrow side streets. 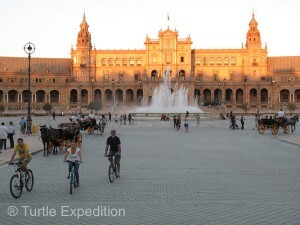 We did a few times. The Jewish quarter was designed as a maze for protection of its residents who knew their way around. Our first impression of the city center was the beautiful complex of the Plaza de España, once the principal building for the 1929 Ibero-American Exposition World’s Fair, which is now mostly used for government offices. 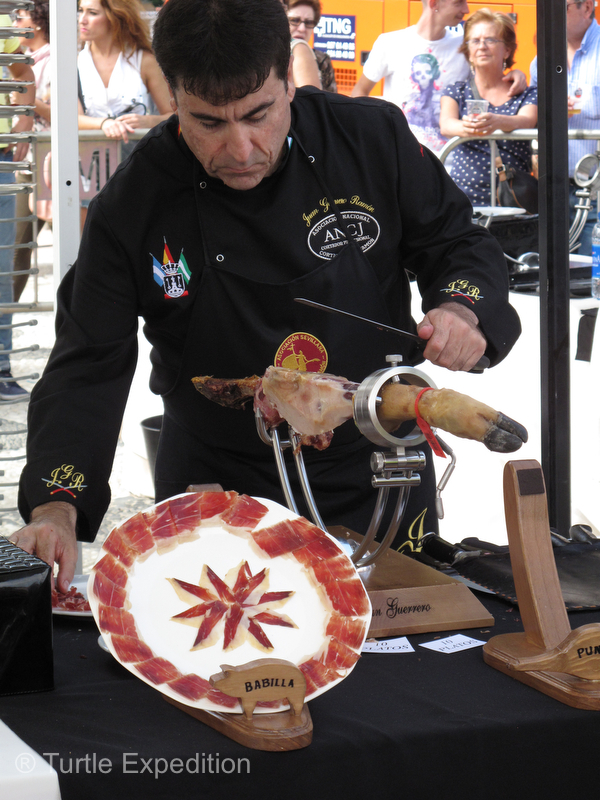 By chance, we happened to arrive when a professional ham carving competition was in progress. 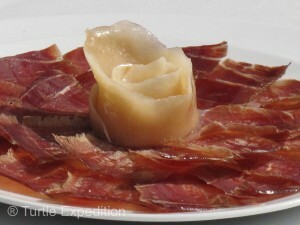 We will show you more about this gourmet delicacy in a later blog when we visit a ham processing plant. 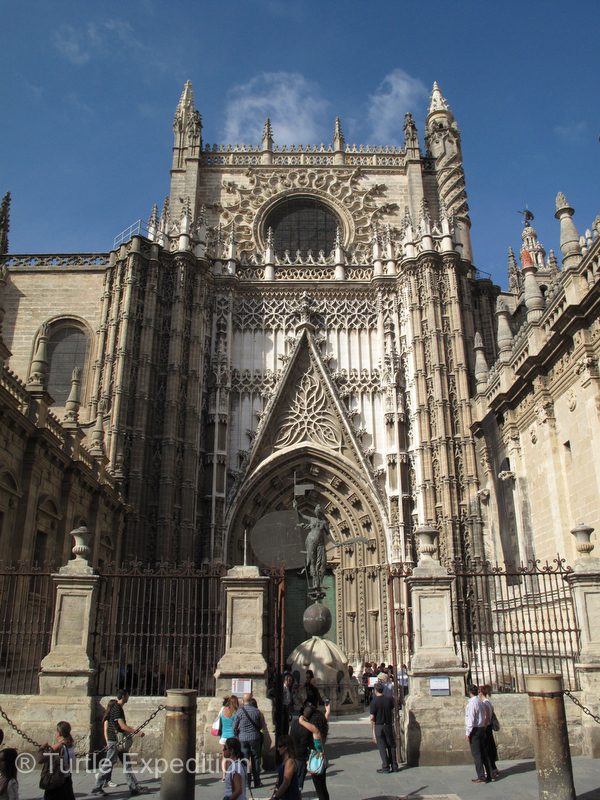 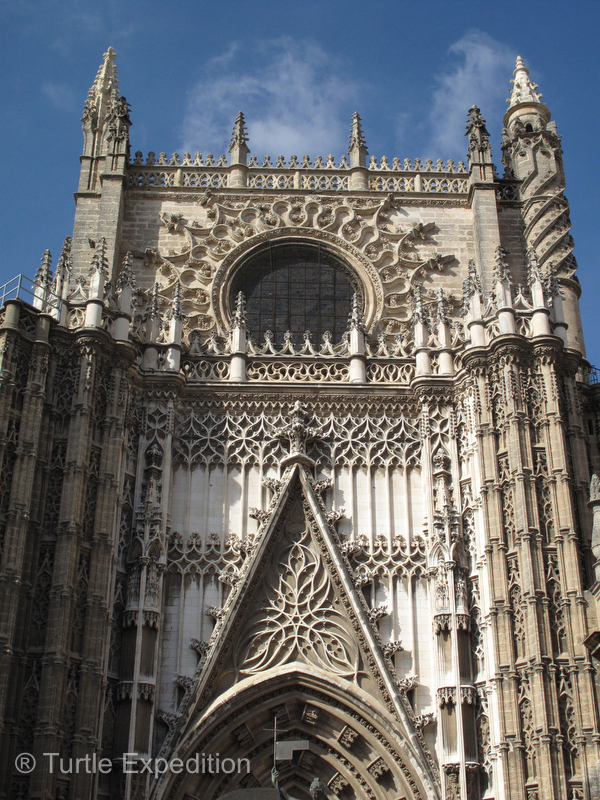 Of the few sites on our must-see list was the Seville Cathedral, otherwise known as the Santa Metropolitana Y Patriarcal Iglesia Catedral de Sevilla (or The Cathedral of St. Mary of the See). Originally Seville’s main Mosque, (1181-1198), it was consecrated as a Cathedral in 1218 with the construction of the Gothic Cathedral continuing from 1131 to 1517. 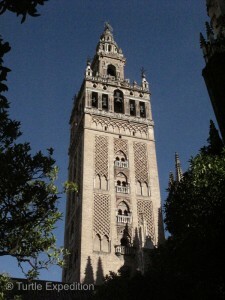 The Mosque’s main minaret was incorporated to form the Giralda bell tower. 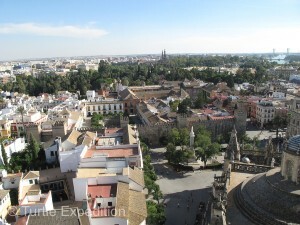 We could actually climb to the top for a great view of the city. 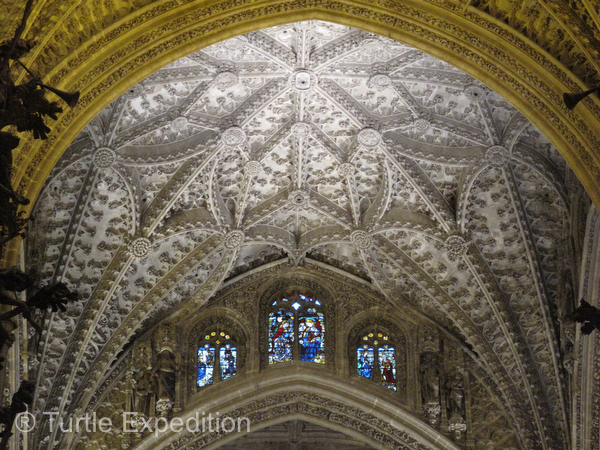 As with so many of these cathedrals we have seen in the past months, a few photos of the interior do not come close to portraying its magnificence, some might say over the top opulence. 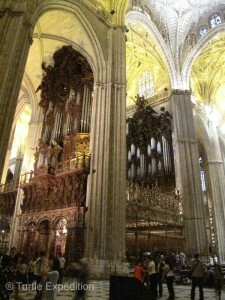 We wish we could have heard one of the two huge organs. 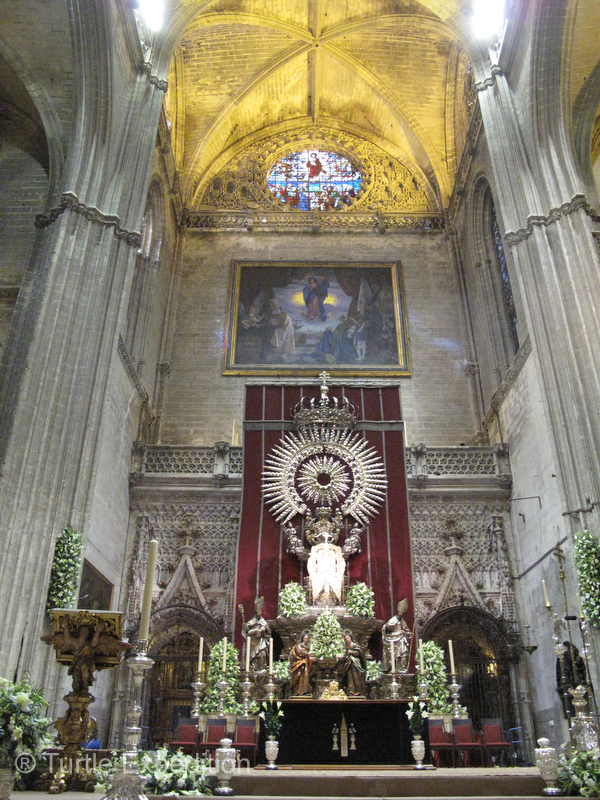 We visited on October 15th so flower wreaths still surrounded the tomb of Christopher Columbus in celebration of his discovery of the Americas. 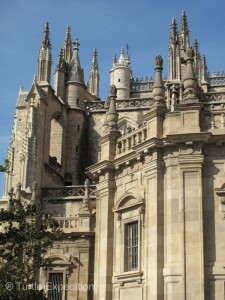 In 1902, his remains were brought back here from Cuba. 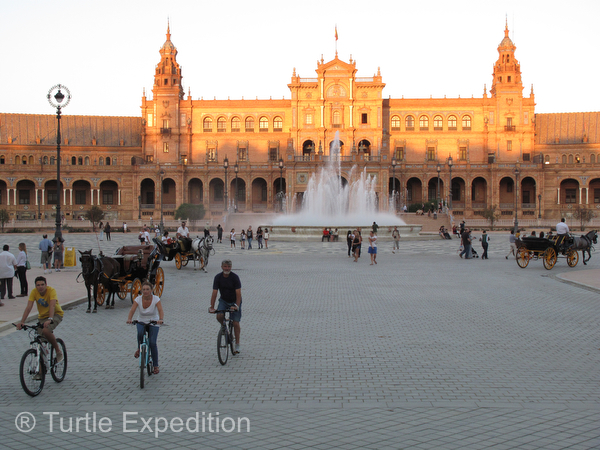 The tourists eat about 7:00 PM and go to bed. The town comes alive after 10:00 when the locals go out for a tapa or dinner. 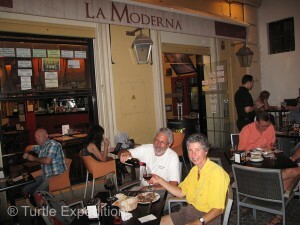 12:00 is not too late to relax at a sidewalk café or catch a flamenco show. 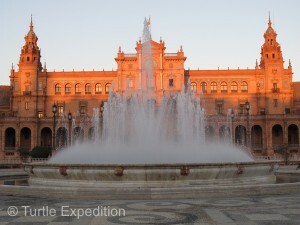 The beautiful Plaza de España complex, once the principal building for the 1929 Ibero-American Exposition World’s Fair, is now mostly used for government offices. 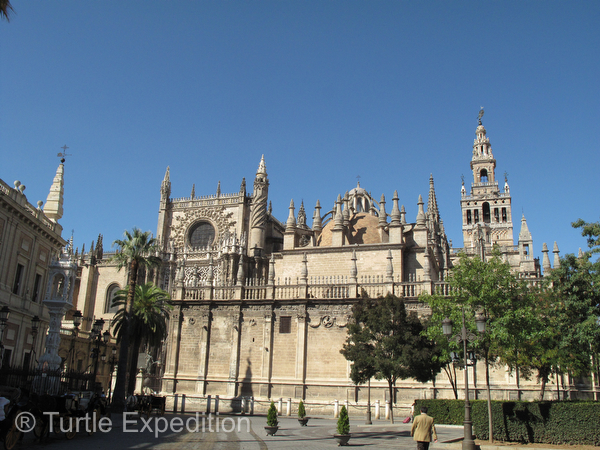 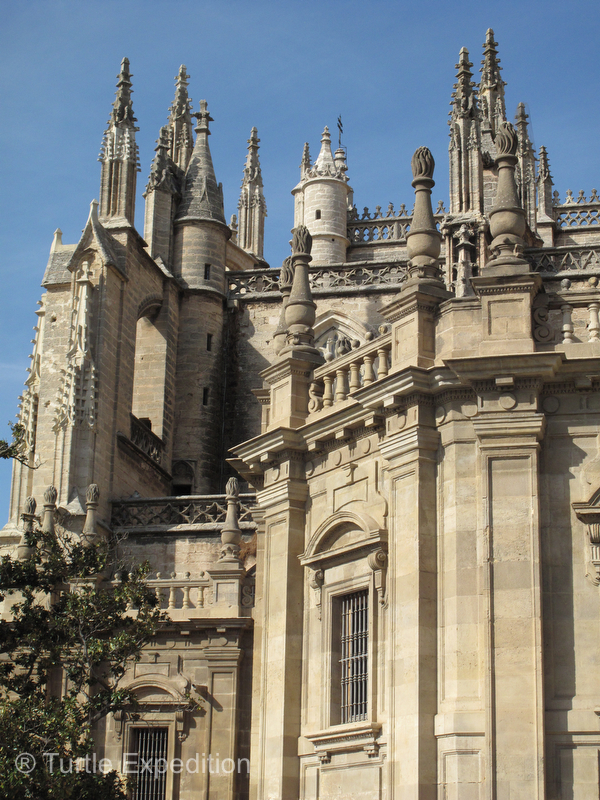 The Gothic towers of the Santa Metropolitana Y Patriarcal Iglesia Catedral de Sevilla are a wonder from any angle. The original Mosque’s main minaret was incorporated to form the Giralda bell tower. 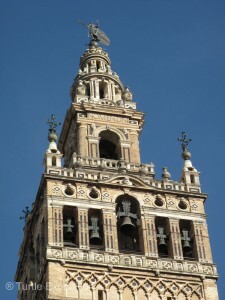 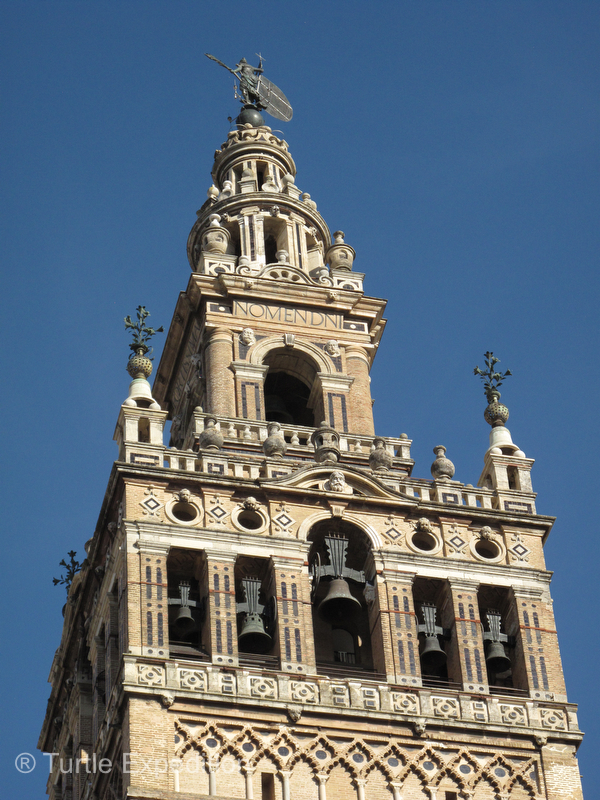 Climbing to the top of the Giralda bell tower, I checked my watch. 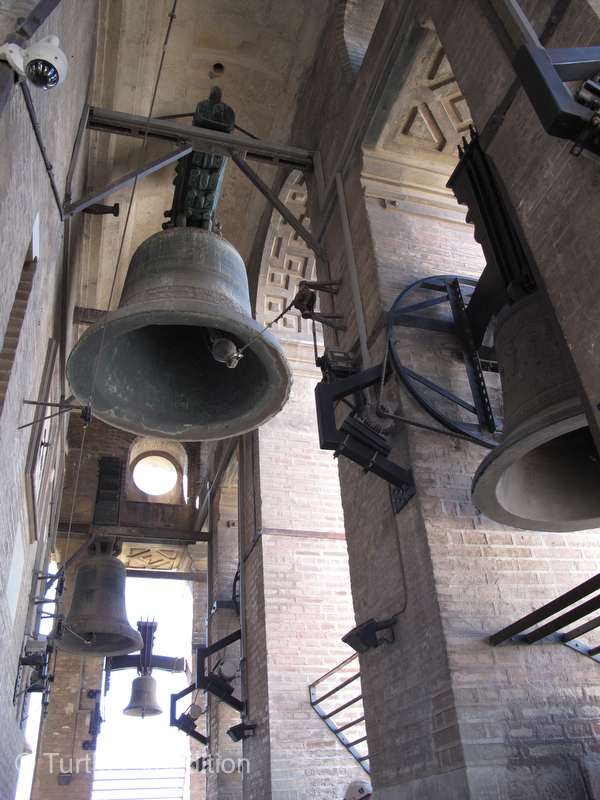 Please, PLEASE—don’t ring the bells!! 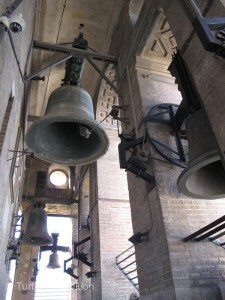 The bells were silent and the view from the bell tower was impressive. 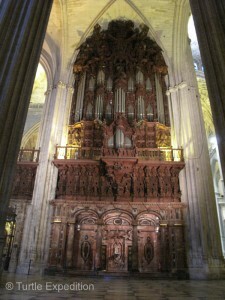 We wish we could have heard one of the two huge double sided organs, but why two? Oh well, the church in Mafra (Portugal), you may recall, had four! It was Columbus Day. 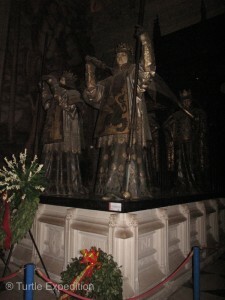 Flower wreaths surrounded the tomb of Christopher Columbus. A few photos cannot show the magnificence of the interior of the Cathedral. Properly slicing paper-thin bites of a $300 Pata Negra Jamón Ibérico de Bellota is a profession and an art, as we saw at this ham-carving competition. 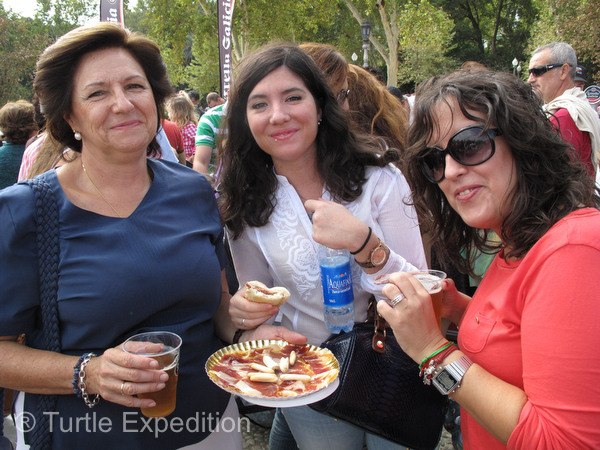 Any time is Tapa time in Seville.